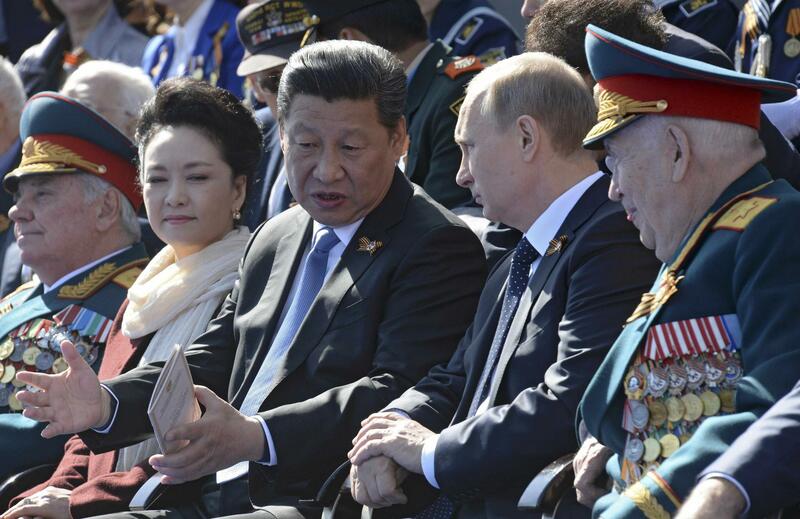 now reading: A Future for the China-Russia Alliance? A Future for the China-Russia Alliance? In turn German chancellor Adolf Hitler gushed over the Reich’s partnership with this “very advanced clan of yellow apes.” Added Hitler: “I salute you, chinky-dinky rat-men….When Germany stands victorious on a conquered Earth, and Aryan supermen wipe out the undesirable mud races one by one, your like will surely survive to be among the last few to be exterminated.” Now there’s a solid alliance for you! Life, it seems, imitates The Onion. Though less unnatural—and in all likelihood less perishable—a marriage than the Axis, the Sino-Russian entente now taking shape is no natural alliance or strategic partnership. Whether two ambitious rising powers that share a permeable frontier and a past marked by conflict—including a war within living memory that could have escalated to a nuclear exchange—remains to be seen. Color me skeptical. These are also two powers that take a proprietary view of their surroundings. Robert Kaplan is doubtless correct to maintain that there’s something universal about the thinking that went into the Monroe Doctrine two centuries ago. At least I hope there is, having built a sizable line of research on this hypothesis. When I give talks on this topic, I postulate that such thinking constitutes a default position for natural hegemons like the United States, which vastly outmatch all neighbors by economic and military indices, inhabit regions girded by serious natural defenses, and boast enough armed might to manage their environs while stiff-arming meddlesome rivals coming from afar. Franklin Roosevelt seemed to soak the idea in from Theodore, proposing that “Four Policemen”—the victorious World War II Allies—should act as custodians of their extended neighborhoods. FDR’s concept found its way into the United Nations, supplying an organizing principle for the Security Council. But there’s one defect, or maybe two, in this way of thinking about regional and world order. One, what if the policemen don’t agree to enforce the same laws in their precincts? Moving from the metaphorical back into the real world, the United States presides over the globalized maritime order where freedom of the sea prevails. China, by contrast, thinks it can assert sovereignty over seas and skies far from its shores—in effect repealing the U.S.-led order in those expanses. Russia may or may not subscribe to China’s vision of the closed sea, but it certainly agrees on the need to oppose American supremacy in waters that wash against Eurasian shores. That’s unity of a sort. And two, what if corrupt cops are walking the beat, intent on using their public trust for private gain? Or, in the real world, what if a regional hegemon abuses its special prerogatives to wrest things from weaker neighbors? The United States pushed Latin American republics around from time to time, especially during the 1890s and the age of the “banana wars.” A saint it was not. Yet China’s claim to offshore waters means poaching exclusive economic zones guaranteed to weaker neighbors under the law of the sea. Russia’s stance on such matters appears less clear. Moscow mainly wants to exclude powerful outsiders while reasserting its primacy. Still, it too lays claim to lesser neighbors’ territory. While each hegemon interprets its prerogatives differently, the Monroe Doctrine is part of each hegemon’s foreign-policy lexicon. Nor does the same phrase mean the same thing at all times. America’s Monroe Doctrine mutated as the nation’s power and external circumstances changed. China disavows any desire for a Monroe Doctrine—seeing the doctrine as an implement of imperialism—even as it does things that would have made James Monroe blush like a schoolgirl. The Soviet Union made noises about a Soviet Monroe Doctrine during the early stages of the Cold War. Post-Soviet Russia could be trying to reinstate that doctrine in places like the Black Sea and Baltic Sea while casting its gaze on the Arctic Ocean. History never repeats itself, but it rhymes. The United States obviously fit the Monroe Doctrine template best, isolated and locally supreme as it was. But what if it had bordered another such great power with similar pretensions? What if Canada, Mexico, or both were peers? That’s the rhyme in Asia: multiple powers are rising that entertain ambitions to regional primacy yet share borders and histories of animosity and war. Whose Monroe Doctrine prevails under such circumstances? The logic of the Monroe Doctrine could set India against China. It could also set China against Russia. Or some complicated and shifting geometry—a.k.a. “a mess”—could take hold. For now China and Russia are united in opposition to the American-led system of freedom of the sea, particularly in Eurasia’s near seas. Indeed, their navies are currently operating in the Mediterranean Sea—as though Beijing and Moscow are notifying Washington that the U.S. Navy’s primacy in Eurasian waters will no longer go uncontested. What’s good for America’s navy is also good for China’s and Russia’s—or for a combined Sino-Russian fleet. Projecting power onto foreign shores from the sea works both ways. But what happens should they see an end to the U.S. forward presence in Asia? One imagines the geopolitical logic expressed by the Onion jokesters would make a comeback—and then some. Think about it. Would the Axis have happened had Aryans and those hated by Aryans been situated next to each other on the map? Doubtful. That unbeatable team would have enjoyed an exceedingly short lifespan. One imagines the same will ultimately befall China and Russia—regardless of how chummy they may be for now.